Being Human takes the interesting perspective of Tommy, the recently turned vampire. The novel is written from his first-person POV, with only five chapters (incredibly long and semi-interior monologue in style); the chapters cover five distinct stages of his vampire life and experience. In the world of Patricia Lynne’s vampires, when a human is turned they remember nothing of their former human life – nothing really of their human selves or values – which is why they often return and kill their own families it seems. When Tommy does exactly this, it is only some inante recognition of the special bond he shares with his twin brother Danny that stops him from killing him as he does their parents. In the early stages of the book, I struggled to like Tommy – he’s heartless, unhuman and is quite blunt. Oh yes – I forgot, that’s because he’s supposed to be that way! He is a vampire after all. Once I got into this, he actually was quite cute and funny – certainly when he was trying to get his head around the intricacies of human/teenage life as his twin experiences it. As you see the new relationship develop with Tommy and Danny, you really see what the novel is about: the examination of what it is to ‘be human’. Tommy asks and examines the questions throughout the book, that we often overlook in everyday life, but that are absolutely necessary in making us what and who we are. I’ve seen this done quite similarly in sci-fi, with books like Human Is?, Do Androids Dream of Electric Sheep and more recently Cinder – it was well done in Being Human. The examination of various types of love – twins, family, children, romantic – is also very nicely done: the relationships feel authentic and give a greater depth than some other vampire books I’ve read. The main focus of Being Human isn’t a romance, but a family bond which trumps survival, human nature and vampire instinct. Overall Thoughts: A well-considered vampire book, with interesting elements and world-building for a ‘post-knowledge setting’ where humans are aware of the existence of vampires. The examination of humanity as Tommy actually goes through the process is interesting and well-thought out: many novels I’ve read with human-esque vamps begin way after they’ve already embraced their human side. Enough action and blood for a vampire book, but not actually the main draw in this case. Good stuff! 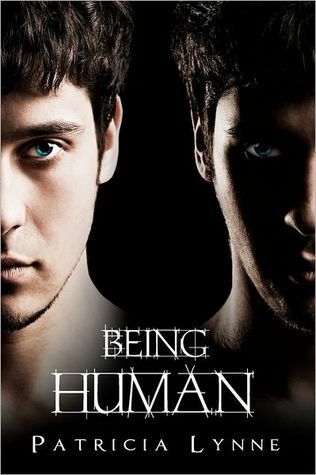 Author Patricia Lynne will be featuring with us in a spotlight and interview later this week and you also have the chance of winning your own copy of Being Human here! This entry was posted in Reviews and tagged 4*, being human, patricia lynne, review, twins, vampire, YA. Bookmark the permalink. I’m always surprised when there’s a new vampire book too. But, when done well, they do show us what it means to “be human”. This one has been getting a lot of promotion, so I hope it lives up to its hype. Thanks for the awesome review of my book and for having me on AFW. Hi,New Follower via facebook. I would love it if you could stop by sometime. I love the cover 🙂 I never tire of good vampire lit. seems really interesting, awesome review! I’ve never seen this book! I clicked on your post because I love the TV show “Being Human”! I will definitely be putting this on my TBR list, I love your post, great writing!